A number of factors come together to make the R5B BOA Donnas some of the most instantly desirable cycling shoes I've had the good fortune to slip my feet into. First off, they mark a departure from the usual solid black or white/silver colour schemes, being a slatey grey with hot pink accents that some will doubtless hate and others love. They're not only good-looking though, they have a raft of performance features to keep even the most demanding rider satisfied. The BOA system and single Velcro strap are designed to optimize both comfort and performance, while the overall lightness of the shoe and stiffness of the carbon reinforced nylon outsole also contribute to enhanced power transfer. The R5B is designed strictly with three hole attachment road cleats in mind. One winning feature for me was the fact that they are available in half sizes, allowing a more finely tuned fit, but sadly it seems to be very difficult to actually find all but full sizes on sale in the UK. Given the combination of the sleek fit, wrapping around the foot, the quite high heel cup and the shortness of the BOA cable, they were a little tricky to get on and off, but utterly stable and snug once on. 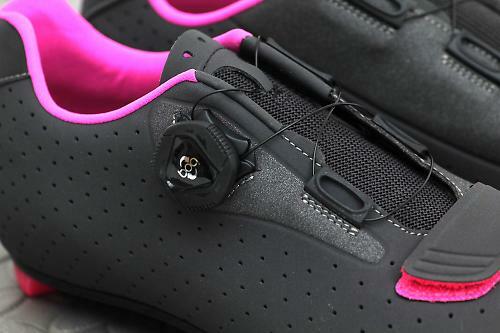 With the BOA closure dialled in (easy and super fast, even on the bike) there was little or none of the movement I often get with cycling shoes. It felt like all my effort was going into rotating the pedals, rather than moving my foot about in the shoe. The fit was comfortable too, with no pressure points from straps, another plus point of the BOA system that allows a much more even pressure distribution across the foot. 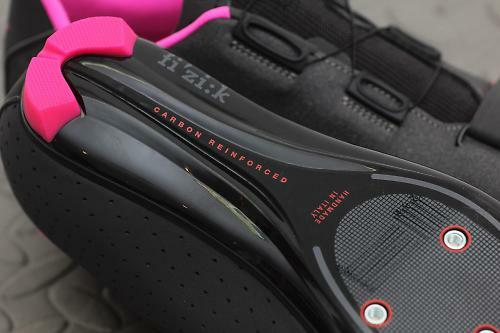 The striking pink heel and toe bumpers were well-positioned and perfect for preventing damage to the carbon fibre reinforced outsole, but I did find myself walking on tip toe now and then, thinking the shoes were far too pretty to even risk damaging. Superb materials and extremely well made. Handmade in Italy and it shows. Comfortable fit and allows for good pedalling efficiency thanks to the BOA fastening. Some wear expected at the heel cup due to the snugness of the fit causing some minor difficulties getting the shoe on, but other than that, should last for years. 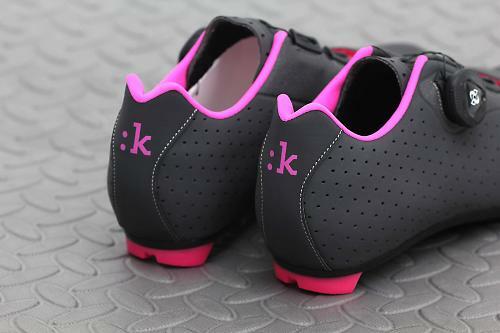 Compares favourably to many high end shoes, even some with fully carbon outsoles. Very comfortable indeed, in part thanks to the BOA fastening distributing pressure evenly across the top of the foot. Fully featured, handmade, well designed, genuinely effective and looks great- punches above its weight for the price. 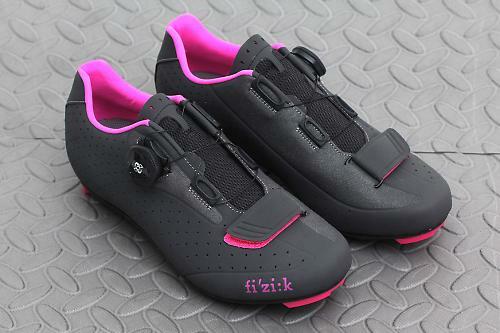 Looks, reflectivity, quality of build, comfort, comfort, stiffness and pedalling efficiency. Half sizes not easily available in UK, despite being made, and slight difficulty getting shoes on due to length of BOA cable but not a big deal. Unusual and striking looking shoes offering all the bells and whistles and performance levels of many much higher priced options. Look! you can tell they're the women's version because they've got some pink on them. I've got the Uomo's in black with green trim and think I'd prefer this colour if it was an option. I (and many of my club mates) are absolutely gutted you can't get this colourway in men's sizes! Indeed. At some point in the future I'd like to get one of my bikes repainted in navy blue and hot pink, or perhaps black and pink, and then add pink bar tape, pink cables, etc... So far so good. Pink saddle? Nope, sorry, ladies only. Rubbish. I think cobalt blue goes better with hot pink. But that's just the way I roll.